Each morning I wake my kids up to get our day going. As I walk into their bedrooms, I have an important choice to make. Will I reach into my pocket and pull out seeds of cranky, tired, or chaos to start our day? Or will I pull out seeds of love, joy, and peace to sprinkle around? I am a firm believer that the woman of the home sets the tone for the home. If we are cranky, our family will be cranky. If we are chaotic and running around like a mad woman, our family will be chaotic and run around like mad. However, if we are full of love and kindness, our family will be full of love and kindness. When we wake our kids, what seeds will we pull out? When our husbands come home from work, what seeds will we pull out? When we go to the grocery store and encounter rude shoppers, what seeds will we pull out? When we go to work and sit next to that co-worker that grates on our last nerve, what seeds will we pull out? Every single day of our lives we walk around with full pockets. We have to choose what seeds we will spread. 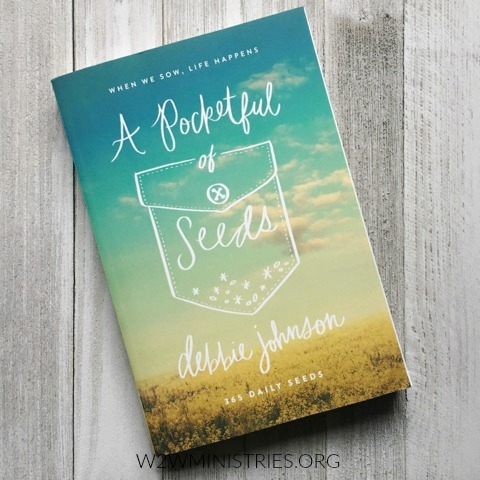 In her brand new devotional, A Pocketful of Seeds, author Debbie Johnson encourages us to make a difference and spread love. Debbie gives us 365 days of ways that we can change the world. Some days she helps us with seeds of love for our home, some days she helps us spread seeds of love for our church or missionaries. And other days she helps us spread seeds of love for strangers. But every day she reminds us that we can make a difference in our homes and even the world. Each devotion is short, something you can read as you brush your teeth in the morning, sit in the pick up line at your child's school, or even while you cook dinner. With the new year fast approaching, what better time to start planting good seeds and making a difference! Pick up your copy of A Pocketful of Seeds HERE. To enter to win A Pocketful of Seeds, complete each task in the rafflecopter below. Every morning, my kids never want to get out of bed and are always cranky. I have learned to take a breath before I react to the stubbornness, and how I react (most of the time) turns their attitude around. This sounds like a wonderfully inspiring book! Thank you for sharing about it!